We use session cookies on our website. These cookies only identify the browser type visiting our internet website. We do not record or process any other cookie information. 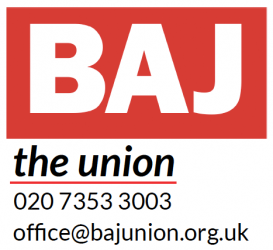 As a BAJ member, we will contact you from time to time using the contact you had provided when you joined. If you would like to contact us for further information please email or call us on 020 735 3003.